The mere echo of the word makes me cringe. What’s a UV light and Why Do I Need One for my AC system? Mold in your Central Air Conditioning System? 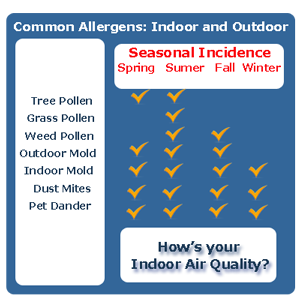 Allergy Season is in Full Bloom...How's Your Indoor Air Quality? Let's talk about your Indoor Air Quality! When's the last time you discussed allergies and how uncomfortable some of your family members are? Here are some suggestions to improve the indoor air quality of your home. Mold in MY air conditioner? No Way! That's what they all say...As we prepare for spring and a hot summer our company begins the change over to air conditioning season. Our spring mailing is on the way to our customer's mailboxes alerting them to call and schedule their annual tune-up. Preventative maintenance is a great way to stay on top of the health of your comfort systems, and we highly recommend it.